I love ice skating outdoors. 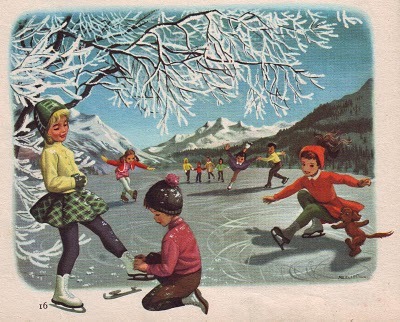 When I was a little girl, I would sometimes skate on Wolverine Lake. On good days, the ice would be black and smooth, and I could lay down, cup my hands around my eyes, and look down through the dark cold and see aquatic plants frozen in the ice. But the lake was several miles from our house, and often it was too windy to really enjoy skating there. Once or twice, I recall, our road was so icy I was able to skate back and forth on it, but it wasn’t quite the same. So my dad built me my own little skating rink in the backyard. It was nothing overly elaborate — just a two-by-four frame. He put down sheet plastic, flooded it with the garden hose, and let it freeze. I vividly remember skating on that little sheet of ice on winter evenings. It was magical. The cold darkness. Silence broken only by the swish of my skate blades. The ice all to myself, but the warm light of home spilling out the windows and onto the snow. I wasn’t doing any double axels or camel spins, but I loved twirling and gliding across the ice. I’ve always dreamed of recreating that backyard skating pond. We live near a lake, but often it is too snowy or too windy to get out there. The nearby town of Palmer has an arena, but I have never enjoyed the harsh lights, strangely still air, and noisy crowds of an indoor ice rink. Yesterday Sam and I moved back the wood pile so he could get the plow truck up into our yard. Then he plowed out a nice little square. Today I’m going to go through our heap of scrap lumber and piece together enough boards to make the frame. It might take a few trips of hauling water, but I think we can make it work. Hopefully my next letter to you will include some photos of our shiny new skating pond. P.S. Thank you all for your kind, enthusiastic reponses to my last letter. I have had a few people email me to ask if I am in fact going to France. ABSOLUTELY! It is a definite yes, yes, yes that I will be going. We are also considering making it a family trip — my 12-year-old might never forgive me if I go to London and Paris without her. My son made a skating rink for my daughter and friends in our yard a number of years ago. It became the place to go! Lydia and her friend Bethany spent many hours skating on our little rink, having a blast. Not having to go anywhere but out the back door to go ice skating was wonderful, as I too, am not fond of going to an indoor skating rink. The kids could go skate whenever they wanted, and mom could watch from the warmth of the house! Love it! We might have to get some design tips if ours doesn’t work out. That’s something I’ve always wanted in our yard too, Eowyn. As a child I rode bike all summer and ice skated all winter. I haven’t skated since Adam was about 4 years old, but like riding a bike you never forget. I can’t wait to see the pictures. How magical! I hope your children love your backyard ice rink. I lived in Vancouver Canada for a couple of years and once it was cold long enough to freeze a sodden field. What a wonderful sight seeing all the local kids out there skating and playing ice hockey. No hope of such an experience in Australia…. As a former competitive skater, this makes me happy! A competitive skater! How amazing! We are a far cry from pro around here, but we have a lot of fun. Do you still skate? I’ve never been one for ice skating, but I remember many times sledding Friends houses over the Holidays and the wonderful feeling of the cold outdoors, and the friendly lights from the indoors shining out over us! I have skated on Wolverine Lake myself! But that was before you were born. Always loved that mountain. Thanks for all your skating and sledding stories everybody. And those of you who live close, you’ll have to come give the pond a try if/when it is done. I’ve got the boards set up, but Sam is a little worried about hauling water in this cold. We had 20 below zero at our house this morning, so we might wait a few days. Only 7 below here! I frostily giggle as I drive past Fish Lake (4 degrees cooler than my house) and around the corner to your driveway – another 2 degrees colder. When I drop to the other side of the ridge, it warms back up to the temperature at my house. Amazing science in Chickaloon! Over on the Pioneer Peak side of the Matanuska Valley we had an ice rink that doubled as a basketball/tennis court in the summer. In “camp” (Dept. of Energy housing project for the hydroelectric plant) there was a fire house and hydrant and hoses. After building up the sides of the rink with snow, the dad’s would hook up the hoses and fill the rink. They usually froze on 2 or 3 layers before we could lace up the skates. I learned to skate backwards and do very simple moves. No competition there. I was competitive on the sled hill though! Have just read this blog entry to my 12 year old son and he is entranced by your ice skating story. Here in Australia we have indoor, artificially made, ice skating rinks. We both think it must have been such a fantastic thing to ice skate with the stars above you and on your own private rink, whenever you wanted. His big thing during Summer hols is to summersault off the long Pier at the beach or lie on the pier face down, looking through the planks of wood for stingrays who silently glide by every now and then. We are lucky here because the beaches are clean with white sand and clear blue water. There is also shade for us mums under the pier, where we can sit and read. addendum, my son now 21 years old. We live in Myrtle Beach, SC. During the holidays last year, the city of Myrtle Beach, publicized that there was a outdoor ice rink you would be able to skate on. When we got there surprise, surprise to us northerners, this was not skating. But, a plastic sheet that was used to skate. We were so upset. They even wanted to charge $10. to skate on. Only about 5 people can skate at a time. People from the south don’t know what they are missing from the north. LOL!! What is this world coming too….